John Minard Trout Sr. was born on Aug. 26, 1874 in Scottdale, Westmoreland County, PA, the son of Isaac F. and Emma (Minerd) Trout. He was named for for his grandfather, Civil War veteran John Vernon Smith Minerd, although he used the "a" rather than the "e" in his middle name. John married Cora Ida Van Dyke (1876-1934). A tintype of her as a young girl is seen here. She grew up in he St. Paul's (Seanor) Lutheran Church of Hempfield Township, Westmoreland County, and joined the congregation on Aug. 6, 1898, under Pastor Jonathan Sarver. Services were performed in English and German in the church during her growing-up years. They had six children - Kenneth V. Trout, Thelma Rae Lacey, John Trout, James "Clifford" Trout, Caroline Miller and Irene Poole Spino. The Trouts resided in New Stanton, Westmoreland County. John worked there as a railroader, with the Pennsylvania Railroad Company. When the federal census was taken in 1910, John and Cora and their three eldest children resided in Hempfield Township, Westmoreland County. Their home was just a few doors away from John's married sister, Anna Belle Hower. That year, John's occupation was listed as "car repairer - railroad company." The 1920 census of New Stanton, Hempfield Township, shows John's employment as railroad track repair. Cora was a member of St. Mark's Lutheran Church of New Stanton, and joined by letter of transfer in 1906, when she was age 30 and had given birth to their first child. She remained a member for the remainder of her life. John was baptized at home by one of the church pastors, at a date unknown. In the 1910s and '20s, the Trout children were baptized at St. Mark's. 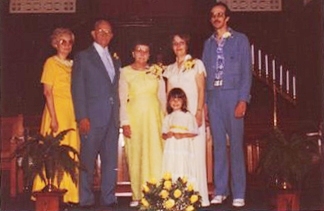 Also members of the congregation at that time was John's cousin, James Stanley Hower and his wife Sarah Ann (Hunker) Hower, and distant cousin Richard A. McVay and his wife Wilma (Ferguson) McVay in the 1940s. The parish's records were preserved by church historian Paul Miller Ruff, and are published in the light-blue cover booklet, St. Mark's Lutheran Church (Mechling Bookbindery), covering the years 1906-1947. The census of 1930 shows John working as a railroad car inspector, and 22-year-old son Kenneth as a valve grinder at at thermostat company. He was assigned to the Pennsy's Monongahela Division. Later, he was promoted to car repairman. Sadly, Cora died of heart failure on May 1, 1934, at the age of 57. She was laid to rest at Seanor Cemetery near New Stanton. John outlived her by seven years. In September 1939, he retired from the Pennsy, with a short article printed in the local newspaper, the Connellsville Daily Courier. He contracted a gastric ulcer, and when it perforated, spreading poison inside his body, he an emergency operation for a "stomach rupture" at Frick Memorial Hospital. He passed away on April 23, 1941, at the age of 67. A brief obituary was printed in the Daily Courier. He rests for eternity with his wife. Daughter Emma Caroline Trout (1905- ? ) was born on Dec. 2, 1905. Her baptism took place St. Mark's Lutheran Church of New Stanton on Oct. 4, 1908. She married John Miller and lived in Philadelphia and later in Lorain, Cuyahoga County, OH. They had at least one daughter, Ann Potts. They celebrated their 50th wedding anniversary, and the photograph of that very special event is seen here. Son Kenneth Vandyke Trout (1907-1994) was born on Aug. 1, 1907. He was baptized the following year, on Oct. 4, 1908, at the St. Mark's Lutheran Church of New Stanton, the same day as his sister Emma's baptism. He married Evelyn Leighty. They had one daughter, Beverly Ann Fox. During the 1946-1947 year, under the pastorship of Rev. C.T. Schlotter, they joined St. Mark's Church, and their daughter was baptized there on March 30, 1947. He was a foreman at Robertshaw, Inc., and prominent in Westmoreland County political and community activities. The Greensburg Tribune-Review said he was "active in the New Stanton Borough incorporation, ... was a former council member of New Stanton and was the first Tax Collector of the borough." He also was a church council member of St. Mark's Lutheran Church and a member of the New Stanton Fair Association and a volunteer with the New Stanton Salvation Army, among other groups. Kenneth died in Westmoreland Regional Hospital in Greensburg on March 28, 1994, at age 86. His funeral was held at the St. Mark's Lutheran Church, followed by burial in Seanors Cemetery in New Stanton. 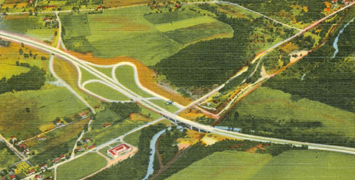 Pennsylvania Turnpike interchange at New Stanton. Image by A.W. McKinney, published by Minsky Bros. & Co. Daughter Thelma Rae Trout (1910-1991) was born on Nov. 22 (or 27), 1909 at Foxtown, Hempfield Township, Westmoreland County. She was baptized on Sept. 1, 1911, at St. Mark's Lutheran Church, with her mother as sponsor. She then joined the church in 1926, when she was age 17. She married Michael A. Lacey and had four children -- Kathleen Govern, Patricia "Pat" Cassa, Michael Lacey and Daniel Lacey. The Laceys resided in Scottdale and later on Smithfield Street in Mount Pleasant, Westmoreland County. An old postcard view of Scottdale's Pittsburgh Street is seen here, looking west from Broadway. They were members of the St. Pius X Catholic Church of Mount Pleasant. Thelma died on March 3, 1991, at the age 81, in Frick Community Health Center in Mount Pleasant. Following a funeral mass at their church, she was laid to rest in St. John the Baptist Catholic Cemetery in Scottdale. At the time of her passing, said the Greensburg Tribune-Review, she was survived by 10 grandchildren and 14 great-grandchildren. Daughter Mildred "Irene" Trout (1912-1982) was born on Jan. 3, 1912. Her baptism was held at St. Mark's Lutheran Church on July 26, 1925, when she was 13 years of age. She joined the congregation the following year. Her first husband was Lloyd Edward Poole (1910-1947), the son of blacksmith William D. and Margaret (Howard) Poole of Greensburg. They were wed on Nov. 23, 1931 in Washington, Washington County, PA, when Irene was age 19 and Lloyd 21. At the time of marriage, Lloyd was a farmer in the rural outskirts of Greensburg. They lived at Mutual, Westmoreland County, and had four children -- John William "Jack" Poole, Thomas Owen Poole, Judith Ann Stalnaker and Donald Edward Poole. Heartache rocked the family on April 13, 1937, when an unnamed infant son died at birth from a defective intestine. He was buried at the church's Hill View Cemetery. Tragically, Lloyd died at home at the age of 37 on Feb. 26, 1947. After a funeral held at the Poole residence, Lloyd was laid to rest in Hillview Cemetery in Greensburg. His death left Irene with four children at home. Later, Irene wed her second husband, Nick Spino (1922-1999), the son of Angelo and Philimeno (Fortana) Spino and the stepson of Justin Pardi. They lived in Greensburg. The Tribune-Review said that Nick "retired from the Elliott Co. with over 35 years. He was a veteran of World War II, serving in the U.S. Army; a member of the Moose, VFW Post 33 and American Legion Post 981." Irene passed away in September 1982 in Greensburg. She was age 70. Nick died at age 77 at home in Greensburg on Nov. 14, 1999. His funeral mass was held at Our Lady of Grace Church, Greensburg, followed by burial in Greensburg Catholic Cemetery. At his death, said the Tribune-Review, he was survived by 10 grandchildren and nine great-grandchildren, adding "He was a great man who thought more of his family than himself and who will be sadly missed by all." Son John William "Jack" Poole (1933-1993) was born on Aug. 8, 1933, in Greensburg. He was baptized at St. Mark's Lutheran Church on April 21, 1935. Jack married Martha Johnson, and they had two children -- David W. Poole and Brenda L. Rekouche. Martha brought two children from a previous marriage, Chris S. Johnson and Donna M. Stairs. Jack was a member of Teamsters Local No. 30, the Loyal Order of Moose and A&B Club of Youngwood. Jack died at the age of 60, at home in Youngwood, on Sept. 9, 1993. Burial was in Hillview Cemetery, following funeral services at the McCauley Funeral Home. Son Thomas Owen Poole (1938- ? ) was born on May 30, 1938. He was baptized on June 30, 1940, at St. Mark's Church, with his mother and grandfather present. Thomas lived in Sun Valley, CA in 1993. Son Donald E. Poole resided in Greensburg in 1993. Daughter Judith A. Poole married (?) Stalnaker and in 1993 lived in Greensburg. Son John Minard Trout Jr. (1914-1972) was born on April 8, 1914. He was baptized on July 26, 1925, at the age of 11, at St. Mark's Lutheran Church, and became a member of the congregation in 1929, at age 15. He worked at Robertshaw in Youngwood, where the company produced thermostats. He is believed to have married Frances Menborn ( ? - ? ) and to have had two known children -- Sharon Emmaline Trout and James Edward Trout. Circa 1964, their home was in New Stanton. John passed away in April 1972, at the age of 58. Son James Edward Trout served in the U.S. Army during the Korean War. He received basic training at Fort Jackson, SC and was trained in aviation electronic equipment maintenance at Fort Gordon, GA. Son James "Clifford" Trout (1919-1988) was born on Aug. 21, 1919. His baptism service was at St. Mark's Lutheran Church on July 26, 1925, as he neared his sixth birthday. He later became a member of the congregation. Clifford married Marjorie (?) and resided in Camden, ME. He died in October 1988 in Bushnell, Sumter County, FL.